Depth of Lake: 29 ft.
Kusel Lake County Park has long been a favorite for swimming, sunbathing, nature walks and soft water fishing in summer; and cross-country skiing and hard water fishing in winter. 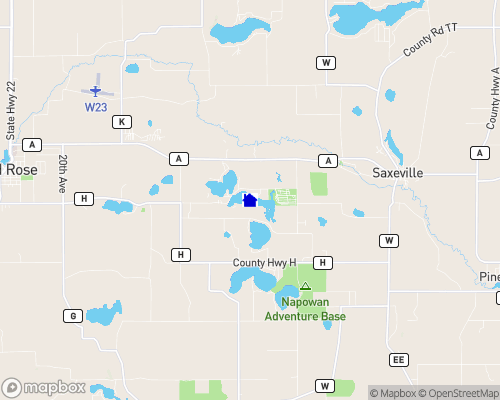 Located in North Central Waushara County on the eastern shore of shallow, sandy bottomed Kusel Lake, this park provides two shelter houses, restrooms, tennis and volleyball courts, children's play equipment and a nature trail. In winter, this park is the trailhead for nearly nine miles of cross country ski trails. Waushara County is located in central Wisconsin, just 87 miles from Green Bay. This region boasts 96 lakes, more than 150 miles of trout streams and a variety of parks. Waushara County is completely rural with not one village having a population larger than 2,500. Waushara County has more than a dozen parks offering a variety of recreational activities. Kusel Lake County Park is a favorite with swimmers and sunbathers because of its sandy bottom and shallow waters. The park also offers boating, fishing, tennis, picnicking and hiking. Mt. Morris Hills County Park is another favorite. It encompasses 377 acres and provides fantastic views of the surrounding countryside. Fish, picnic, play tennis or horseshoes.